It appears from this verse that all the objects of our sense gratification are the products of egoism in ignorance. It is understood from this verse that by agitation of the element of egoism in ignorance, the first thing produced was sound, which is the subtle form of ether. It is stated also in the Vedanta-sutra that sound is the origin of all objects of material possession and that by sound one can also dissolve this material existence. Anavrttih sabdat means "liberation by sound." The entire material manifestation began from sound, and sound can also end material entanglement, if it has a particular potency. The particular sound capable of doing this is the transcendental vibration Hare Krsna. Our entanglement in material affairs has begun from material sound. Now we must purify that sound in spiritual understanding. There is sound in the spiritual world also. If we approach that sound, then our spiritual life begins, and the other requirements for spiritual advancement can be supplied. We have to understand very clearly that sound is the beginning of the creation of all material objects for our sense gratification. Similarly, if sound is purified, our spiritual necessities also are produced from sound. Here it is said that from sound the ether became manifested and that the air became manifested from ether. How the ethereal sky comes from sound, how the air comes from sky and how fire comes from air will be explained later on. Sound is the cause of the sky, and sky is the cause of srotram, the ear. The ear is the first sense for receiving knowledge. One must give aural reception to any knowledge one wants to receive, either material or spiritual. Therefore srotram is very important. The Vedic knowledge is called sruti; knowledge has to be received by hearing. By hearing only can we have access to either material or spiritual enjoyment. In the material world, we manufacture many things for our material comfort simply by hearing. They are already there, but just by hearing, one can transform them. If we want to build a very high skyscraper, this does not mean that we have to create it. The materials for the skyscraper--wood, metal, earth, etc.--are already there, but we make our intimate relationship with those already created material elements by hearing how to utilize them. Modern economic advancement for creation is also a product of hearing, and similarly one can create a favorable field of spiritual activities by hearing from the right source. Arjuna was a gross materialist in the bodily conception of life and was suffering from the bodily concept very acutely. But simply by hearing, Arjuna became a spiritualized, Krsna conscious person. Hearing is very important, and that hearing is produced from the sky. By hearing only can we make proper use of that which already exists. The principle of hearing to properly utilize preconceived materials is applicable to spiritual paraphernalia as well. We must hear from the proper spiritual source. Remarkably, it turns out there is five times more material in clusters of galaxies than we would expect from the galaxies and hot gas we can see. Most of the stuff in clusters of galaxies is invisible and, since these are the largest structures in the Universe held together by gravity, scientists then conclude that most of the matter in the entire Universe is invisible. This invisible stuff is called 'Dark Matter', a term initially coined by Fritz Zwicky who discovered evidence for missing mass in galaxies in the 1930s. There is currently much ongoing research by scientists attempting to discover exactly what this dark matter is, how much there is, and what effect it may have on the future of the Universe as a whole. 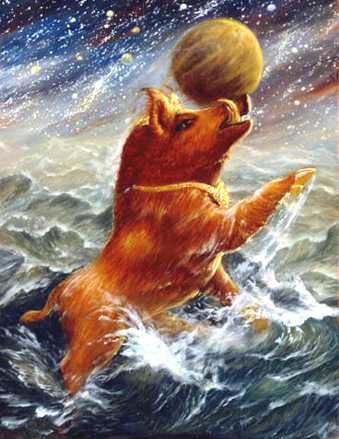 Lord Brahma said: When the unlimitedly powerful Lord assumed the form of a boar as a pastime, just to lift the planet earth, which was drowned in the great ocean of the universe called the Garbhodaka, the first demon [Hiranyaksa] appeared, and the Lord pierced him with His tusk. Since the beginning of creation, the demons and the demigods, or the Vaisnavas, are always the two classes of living beings to dominate the planets of the universes. Lord Brahma is the first demigod, and Hiranyaksa is the first demon in this universe. Only under certain conditions do the planets float as weightless balls in the air, and as soon as these conditions are disturbed, the planets may fall down in the Garbhodaka Ocean, which covers half the universe. The other half is the spherical dome within which the innumerable planetary systems exist. The floating of the planets in the weightless air is due to the inner constitution of the globes, and the modernized drilling of the earth to exploit oil from within is a sort of disturbance by the modern demons and can result in a greatly harmful reaction to the floating condition of the earth. A similar disturbance was created formerly by the demons headed by Hiranyaksa (the great exploiter of the gold rush), and the earth was detached from its weightless condition and fell down into the Garbhodaka Ocean. "O Kesava! O Supreme Lord who have assumed the form of a boar! O Lord! The planet earth rested on Your tusks, and it appeared like the moon engraved with spots." Such is the symptom of an incarnation of the Lord. The incarnation of the Lord is not the concocted idea of fanciful men who create an incarnation out of imagination. The incarnation of the Lord appears under certain extraordinary circumstances like the above-mentioned occasion, and the incarnation performs a task which is not even imaginable by the tiny brain of mankind. The modern creators of the many cheap incarnations may take note of the factual incarnation of God as the gigantic boar with a suitable snout to carry the planet earth. When the Lord appeared to pick up the earth, the demon of the name Hiranyaksa tried to create a disturbance in the methodical functions of the Lord, and therefore he was killed by being pierced by the Lord's tusk. According to Srila Jiva Gosvami, the demon Hiranyaksa was killed by the hand of the Lord. Therefore his version is that after being killed by the hand of the Lord, the demon was pierced by the tusk. Srila Visvanatha Cakravarti Thakura confirms this version. Scientists at the massive Large Hadron Collider under the Swiss Alps have easily replicated the innovative mini-Big Bang results of a previous experiment which created the ‘primordial soup’ of the just-born universe. Super-hot ‘quark-gluon plasma’ is believed to have existed just nano-seconds after the Big Bang, and to have formed the stuff of galaxies, planets, suns, and all life forms. Such new data on the birth of the universe is pouring in from the experiments, leading physicists to consider extending the current phase of the project for two more years. The new results took only days of colliding lead ions in the massive machine at ultra-high energies, and produced temperatures 500,000 times higher than in the sun’s core. The resultant mini-Big Bangs were even more intense than those caused using hydrogen protons during the Collider’s first seven months of operation. The planned two-year extension could result in earlier discovery of the Higgs Boson particle believed to be the stimulus which changed the initial fabric of the universe, an amorphous mass of particles, into solid matter. According to CERN Director General Rolf Heuer, scientists working on the project want to maintain the momentum of the new discoveries, as everything previously understood has now been confirmed and new territories are waiting to be explored. The ‘known unknowns’ are coming into view, and the as yet unimaginable lies beyond. The Large Hadron Collider is at present being shut down for its regular winter maintenance schedule and experiments will recommence in February next year. My dear sons, you should not envy any living entity--be he moving or nonmoving. Knowing that I am situated in them, you should offer respect to all of them at every moment. In this way, you offer respect to Me. In this verse the word vivikta-drgbhih, meaning without envy. is used. All living entities are the abode of the Supreme Personality of Godhead in His Paramatma feature. As confirmed in Brahma-samhita: andantara-stham paramanu-cayantara-stham. The Lord is situated in this universe as Garbhodakasayi Visnu and Ksirodakasayi Visnu. 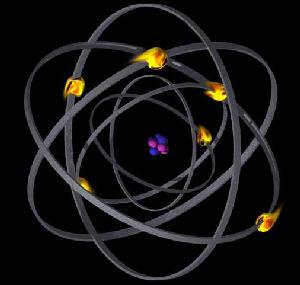 He is also situated within every atom. According to the Vedic statement: isavasyam idam sarvam. The Supreme Lord is situated everywhere, and wherever He is situated is His temple. We even offer respects to a temple from a distant place, and all living entities should similarly be offered respect. This is different from the theory of pantheism, which holds that everything is God. Everything has a relationship with God because God is situated everywhere. We should not make any particular distinction between the poor and the rich like the foolish worshipers of daridra-narayana. Narayana is present in the rich as well as the poor. One should not simply think Narayana is situated among the poor. He is everywhere. An advanced devotee will offer respects to everyone--even to cats and dogs. Are stars powered from within, or does the power come from elsewhere? This was the question asked by Sir Arthur Eddington in the 1920s. He settled for the former, and this laid the foundation for current mainstream models. Ralph Juergens asked the question again in the 1970s, and opted for the latter. According to Juergens, stars shine because they are connected to electric circuitry within galaxies. An electric star's brightness thus depends on the power of the electric current feeding it, not on the amount of nuclear fuel available to burn. Stars thus behave as electrodes in a galactic glow discharge. 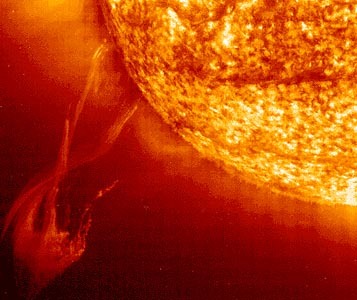 The many surface phenomena that can be seen on the Sun -- hot corona, sunspots, prominences, flares, et al -- can all be explained by an electric Sun, but are more difficult to understand from a nuclear point of view. Nuclear reactions take place on the surface, not in the core, perhaps explaining why neutrino numbers vary with sunspot cycles, and these reactions are almost certainly produced in the same way that we produce them in the lab -- by accelerating particles in an electric field. Stars, galaxies, nebulae, and planets are all affected by electric currents in the plasma through which they move. If the appearance of a star is determined largely by its electrical environment, it follows that it can change relatively quickly! By the force of the pregnancy of Diti, the light of the sun and moon was impaired in all the planets, and the demigods of various planets, being disturbed by that force, asked the creator of the universe, Brahma, "What is this expansion of darkness in all directions?" It appears from this verse of Srimad-Bhagavatam that the sun is the source of light for all the planets in the universe. The modern scientific theory which states that there are many suns in each universe is not supported by this verse. It is understood that in each universe there is only one sun, which supplies light to all the planets. In Bhagavad-gita the moon is also stated to be one of the stars. There are many stars, and when we see them glittering at night we can understand that they are reflectors of light; just as moonlight is a reflection of sunlight, other planets also reflect sunlight, and there are many other planets which cannot be seen by our naked eyes. The demoniac influence of the sons in the womb of Diti expanded darkness throughout the universe. Scientists using different methods to determine the mass of galaxies have found a discrepancy that suggests ninety percent of the universe is matter in a form that cannot be seen. Some scientists think dark matter is in the form of massive objects, such as black holes, that hang out around galaxies unseen. Other scientists believe dark matter to be subatomic particles that rarely interact with ordinary matter. This paper is a review of current literature. I look at how scientists have determined the mass discrepancy, what they think dark matter is and how they are looking for it, and how dark matter fits into current theories about the origin and the fate of the universe. This universal egg, or the universe in the shape of an egg, is called the manifestation of material energy. Its layers of water, air, fire, sky, ego and mahat-tattva increase in thickness one after another. Each layer is ten times bigger than the previous one, and the final outside layer is covered by pradhana. Within this egg is the universal form of Lord Hari, of whose body the fourteen planetary systems are parts. This universe, or the universal sky which we can visualize with its innumerable planets, is shaped just like an egg. As an egg is covered by a shell, the universe is also covered by various layers. The first layer is water, the next is fire, then air, then sky, and the ultimate holding crust is pradhana. Within this egglike universe is the universal form of the Lord as the virat-purusa. All the different planetary situations are parts of His body. This is already explained in the beginning of Srimad-Bhagavatam, Second Canto. The planetary systems are considered to form different bodily parts of that universal form of the Lord. Persons who cannot directly engage in the worship of the transcendental form of the Lord are advised to think of and worship this universal form. The lowest planetary system, Patala, is considered to be the sole of the Supreme Lord, and the earth is considered to be the belly of the Lord. 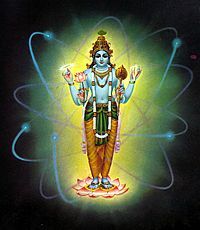 Brahmaloka, or the highest planetary system, where Brahma lives, is considered to be the head of the Lord. This virat-purusa is considered an incarnation of the Lord. The original form of the Lord is Krsna, as confirmed in Brahma-samhita: adi-purusa. The virat-purusa is also purusa, but He is not adi-purusa. The adi-purusa is Krsna. Isvarah paramah krsnah sac-cid-ananda-vigrahah. anadir adir govindah. In Bhagavad-gita Krsna is also accepted as the adi-purusa, the original. Krsna says, "No one is greater than I." There are innumerable expansions of the Lord, and all of them are purusas, or enjoyers, but neither the virat-purusa nor the purusa-avataras--Karanodakasayi Visnu, Garbhodakasayi Visnu and Ksirodakasayi Visnu--nor any of the many other expansions, is the original. In each universe there are Garbhodakasayi Visnu, the virat-purusa and Ksirodakasayi Visnu. The active manifestation of the virat-purusa is described here. 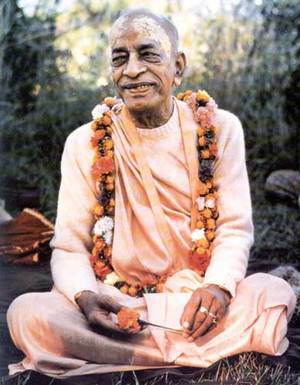 Persons who are in the lower grade of understanding regarding the Supreme Personality of Godhead may think of the universal form of the Lord, for that is advised in the Bhagavatam. The dimensions of the universe are estimated here. The outer covering is made of layers of water, air, fire, sky, ego and mahat-tattva, and each layer is ten times greater than the one previous. The space within the hollow of the universe cannot be measured by any human scientist or anyone else, and beyond the hollow there are seven coverings, each one ten times greater than the one preceding it. The layer of water is ten times greater than the diameter of the universe, and the layer of fire is ten times greater than that of water. Similarly, the layer of air is ten times greater than that of fire. These dimensions are all inconceivable to the tiny brain of a human being. It is also stated that this description is of only one egglike universe. There are innumerable universes besides this one, and some of them are many, many times greater. It is considered, in fact, that this universe is the smallest; therefore the predominating superintendent, or Brahma, has only four heads for management. In other universes, which are far greater than this one, Brahma has more heads. In the Caitanya-caritamrta it is stated that all these Brahmas were called one day by Lord Krsna on the inquiry of the small Brahma, who, after seeing all the larger Brahmas, was thunderstruck. That is the inconceivable potency of the Lord. No one can measure the length and breadth of God by speculation or by false identification with God. These attempts are symptoms of lunacy. In the Twelfth Canto of Srimad-Bhagavatam, it is said that in this age of Kali everyone will be extremely disturbed by three kinds of tribulations: scarcity of rain, famine, and heavy taxation by the government. Because human beings are becoming more and more sinful. there will be a scarcity of rain, and naturally no food grains will be produced. On the plea of relieving the suffering caused by the ensuing famine, the government will impose heavy taxes, especially on the wealthy mercantile community.In this verse, the members of such a government are described as dasyu, thieves. Their main activity will be to plunder the wealth of the people. Whether a highway robber or a government thief, such a man will be punished in his next life by being thrown into the hell known as Sarameyadana, where he will suffer greatly from the bites of ferocious dogs. It is stated in Srimad-Bhagavatam that in Kali-yuga the heads of government will be plunderers and thieves. These thieves and plunderers take the money and property of the public by force or connivance. Therefore it is said in Srimad-Bhagavatam, rajanyair nirghrnair dasyu-dharmabhih. As Kali-yuga advances, we can see that these characteristics are already visible. We can certainly imagine how deteriorated human civilization will be by the end of Kali-yuga. Indeed, there will no longer be a sane man capable of understanding God and our relationship with Him. In other words, human beings will be just like animals. At that time, in order to reform human society, Lord Krsna will come in the form of the Kalki avatara. His business will be to kill all the atheists because ultimately the real protector is Visnu, or Krsna. The Lord incarnates and sets things in order when things are mismanaged by so-called kings and heads of government. As Krsna says in Bhagavad-gita, yada yada hi dharmasya glanir bhavati bharata. Of course this takes many years, but the principle is there. When the king or governmental head does not follow the proper principles, nature deals out the punishments in the forms of war, famine and so forth. Therefore if the governmental head is not aware of life's goal, he should not take charge of ruling the people. Actually the supreme proprietor of everything is Lord Visnu. He is the maintainer of everyone. The king, the father, and the guardian are simply representatives of Lord Visnu, empowered by Him to look after the management and maintain things. It is therefore the duty of the head of the state to maintain the general populace in such a way that people will ultimately know the goal of life. Na te viduh svartha-gatim hi visnum. Unfortunately the foolish governmental head and the general populace do not know that the ultimate goal of life is to understand and approach Lord Visnu. Without this knowledge, everyone is in ignorance, and all society is crowded with cheaters and cheated. King Rahugana was proud of being king, and he felt he had the right to control the citizens as he liked, but actually he was engaging men in carrying his palanquin without payment, and therefore he was causing them trouble without reason. Nonetheless, the King was thinking that he was the protector of the citizens. Actually the king should be the representative of the Supreme Personality of Godhead. For this reason he is called nara-devata, the Lord among human beings. However, when a king thinks that because he is the head of the state, he can utilize the citizens for his sense gratification, he is in error. Such an attitude is not appreciated by learned scholars. According to the Vedic principles, the king should be advised by learned sages, brahmanas and scholars, who advise him according to the injunctions given in the dharma-sastra. The duty of the king is to follow these instructions. Learned circles do not appreciate the king's utilizing public endeavor for his own benefit. His duty is to give protection to the citizens instead. The king should not become such a rogue that he exploits the citizens for his own benefit.